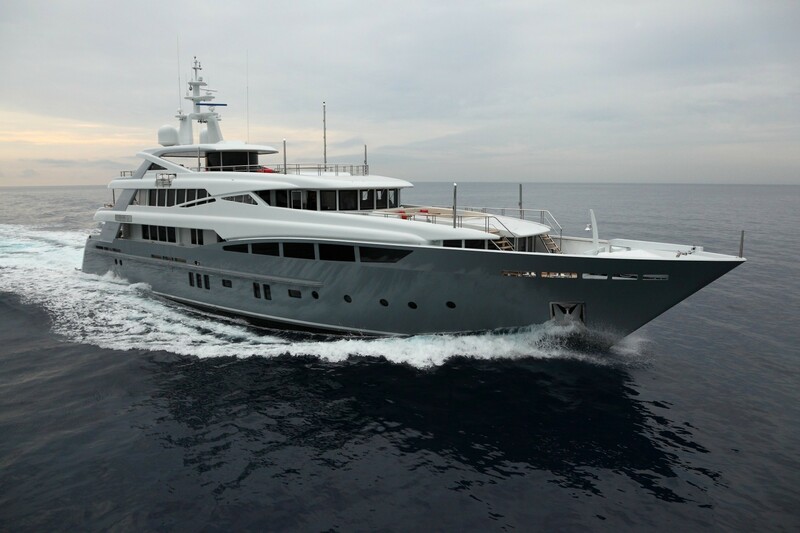 This stunning 46.35m/152ft CUSTOM SUPERYACHT by Rossinavi was launched in 2012 with naval architecture from Mulder Design B.V. 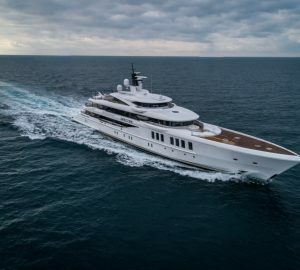 Her sleek raked bow, traditional grey hull and white superstructure are constructed from steel and the 2016-refitted interiors are the work of Tommaso Spadolini & Bernardo Papetti from Studio Spadolini. 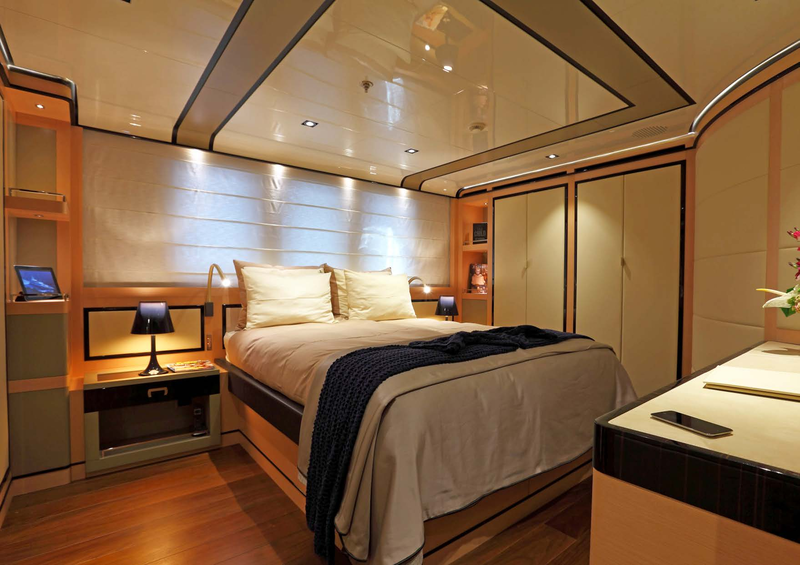 The accommodation sleeps a maximum of 12 guests over six beautiful en-suite cabins which include two Master suites, and the crew of 10 will provide stellar service throughout any journey. 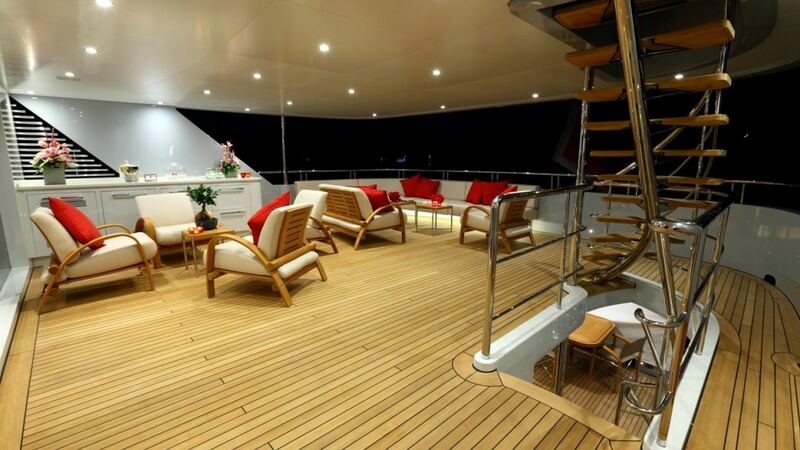 The lower deck swim platform has plenty of room for sunbathing beside the water and grants access to the tender garage which doubles as a beach club when empty. 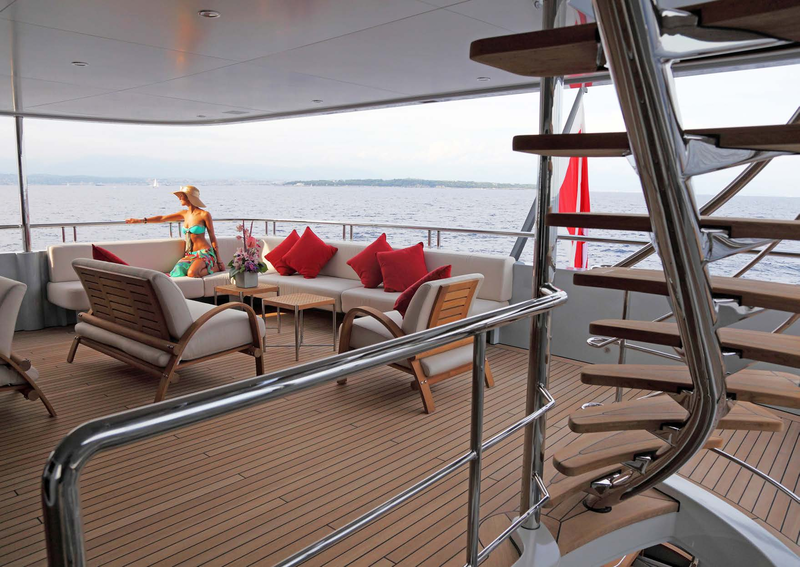 Staircases connect up to the main deck aft, where there is an alfresco dining area to seat up to 10 guests with sweeping views out across the stern. 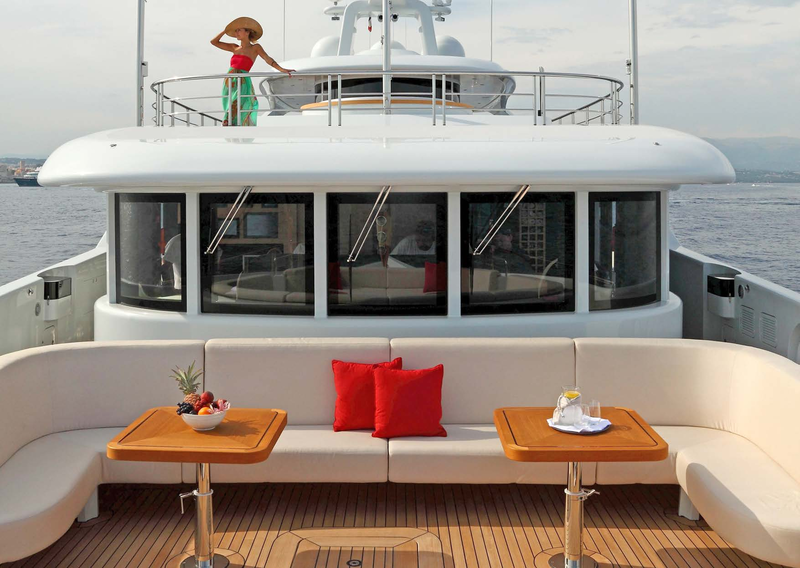 On the upper deck, the aft is fitted with a starboard seating area to starboard with a corner sofa and large armchairs around a coffee table. Additional seating is placed close to the doors to the skylounge, adding another social space in the shade. 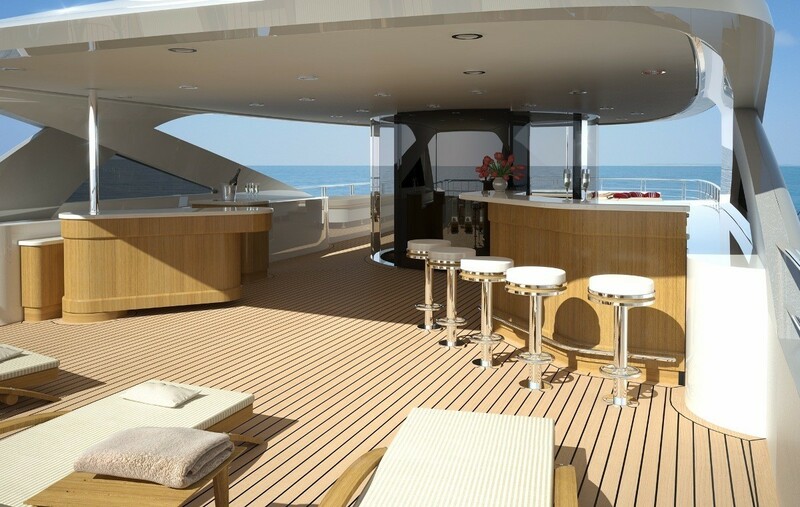 The foredeck also offers guests a sizeable alfresco lounge and casual dining area, with a C-shaped sofa taking in uninterrupted views across the bow with two drinks tables and a forward sofa/sunbed. 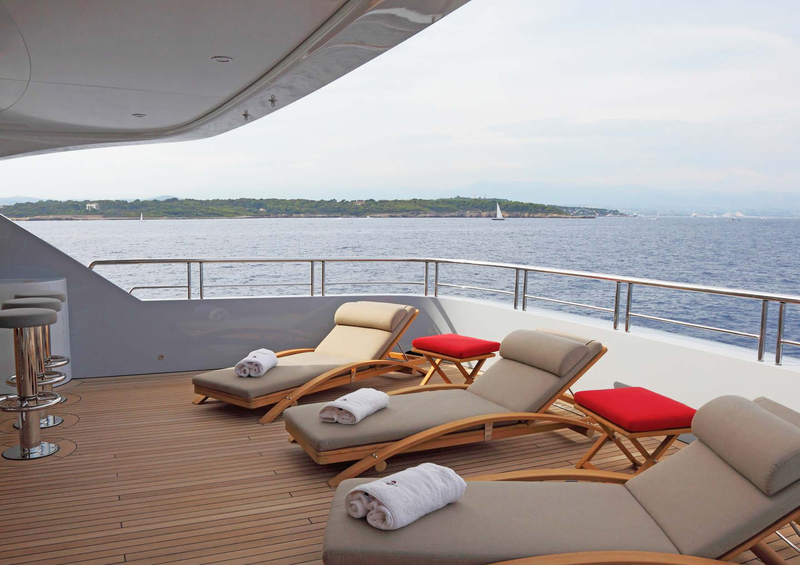 On the flybridge, sun loungers line the aft with the central section shading a corner wet bar with six stools. 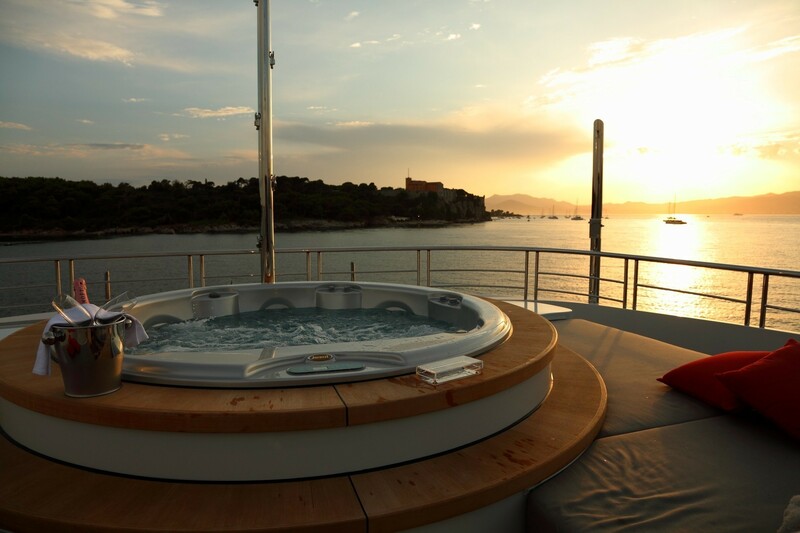 The Jacuzzi is placed on the flybridge forward with plush sunpads to either side. 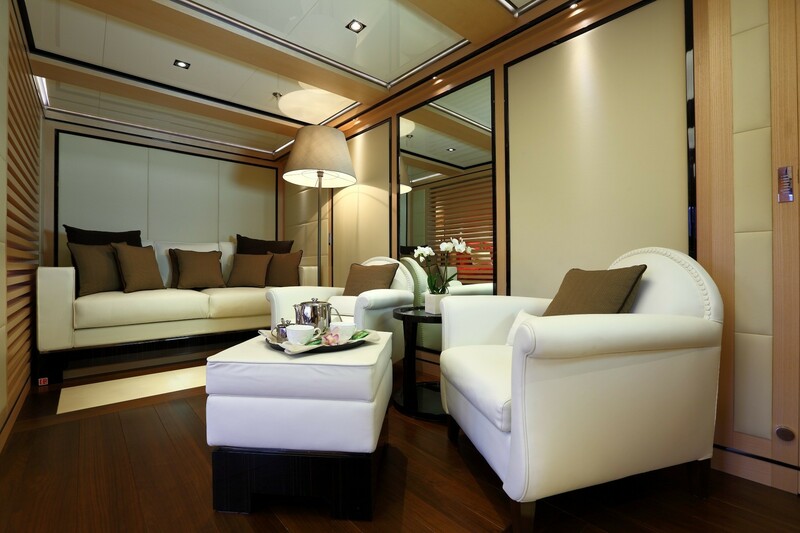 The modern interiors from Studio Spadolini use rich wooden panelling combined with polished stainless steel and glass fittings as well as gloss ceilings to manipulate the light. The minimalist design emphasises the space within and numerous windows provide a greater connection with the environment. 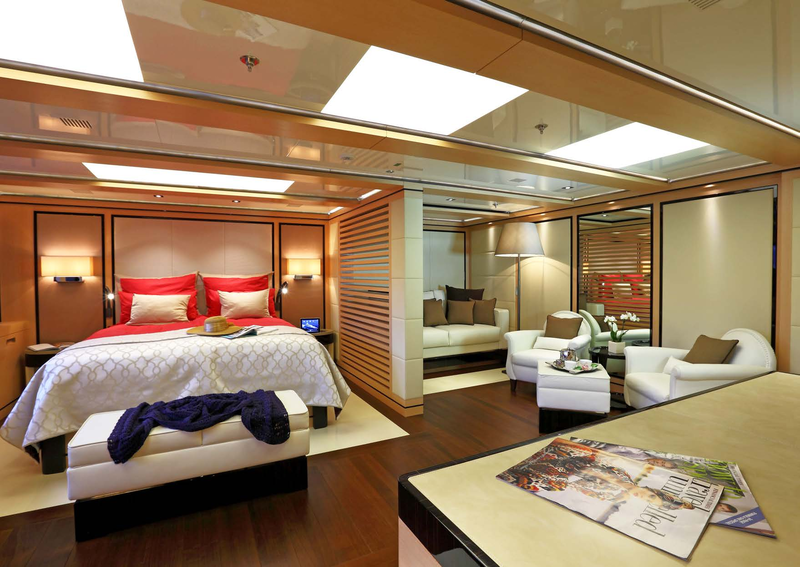 The lower deck hosts the crew accommodation and mess in the bow, while the guest accommodation is located amidships and contains two forward twin cabins and two VIP staterooms behind. 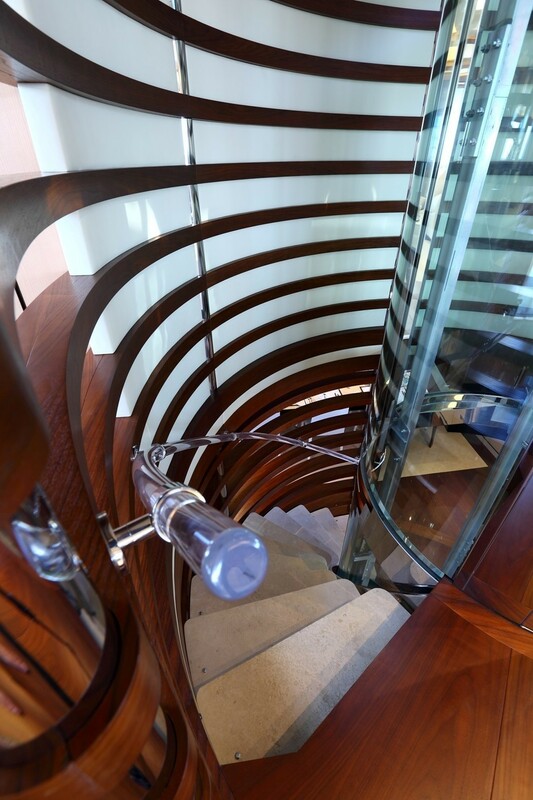 A spiral staircase up to the main deck separates the accommodation from the engine room, while the stern section is used to store the tenders and water toys. 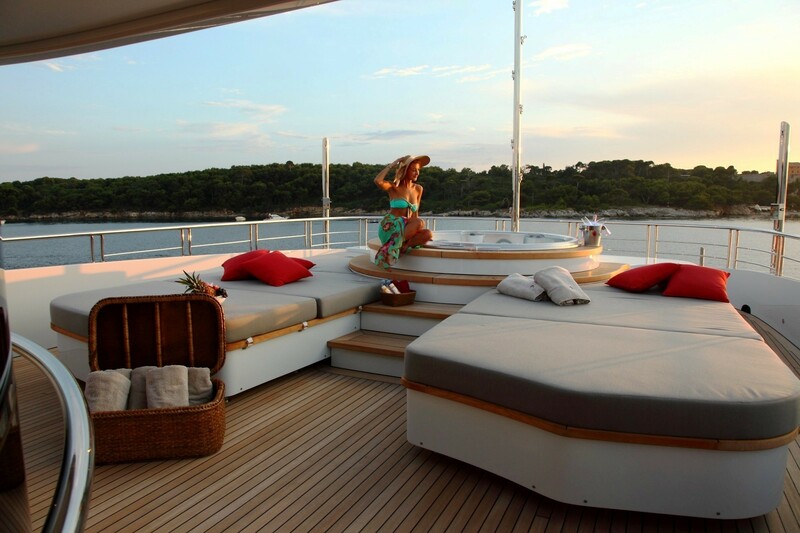 When clear the area can be used as a beach club and a sauna room is located next to the day head. 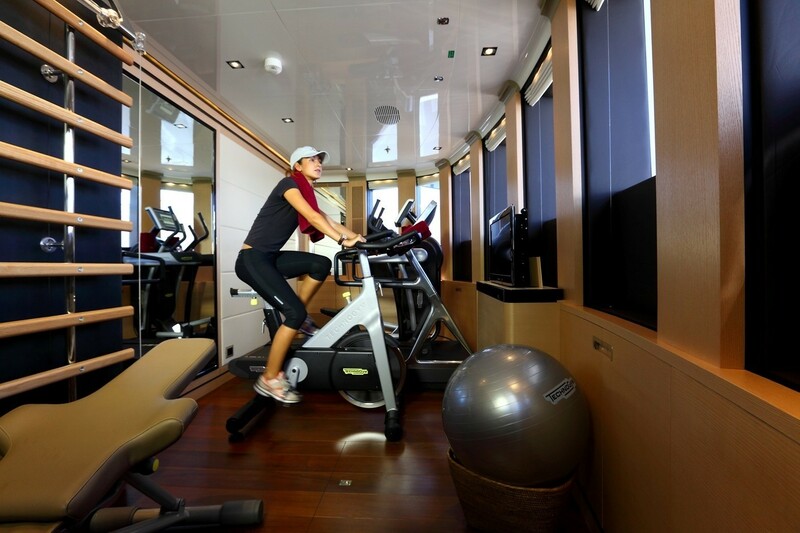 The main deck forward hosts one of the two Master suites and a corridor to starboard allows all guests to access the forward gym which comes with a running machine, spinning bike and free weights among the available equipment. 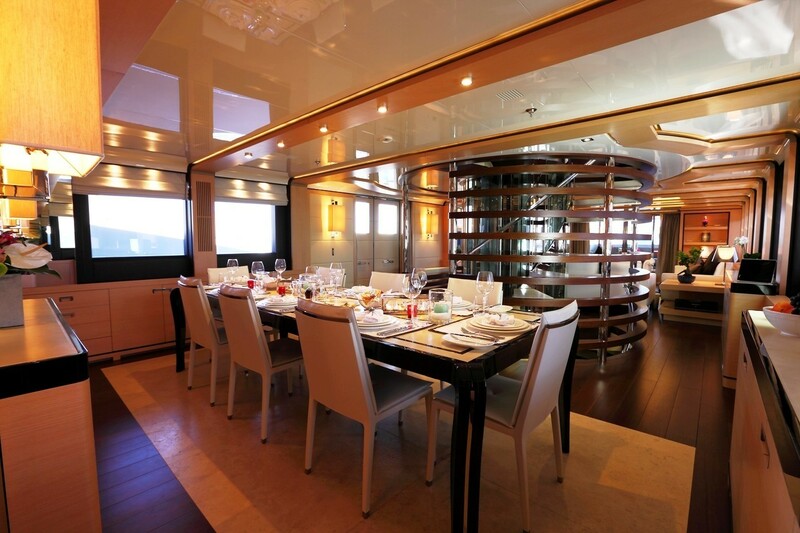 Behind the amidships galley is the main salon, within which there is a forward formal dining area to seat 12 with fantastic views out of the port and starboard windows. 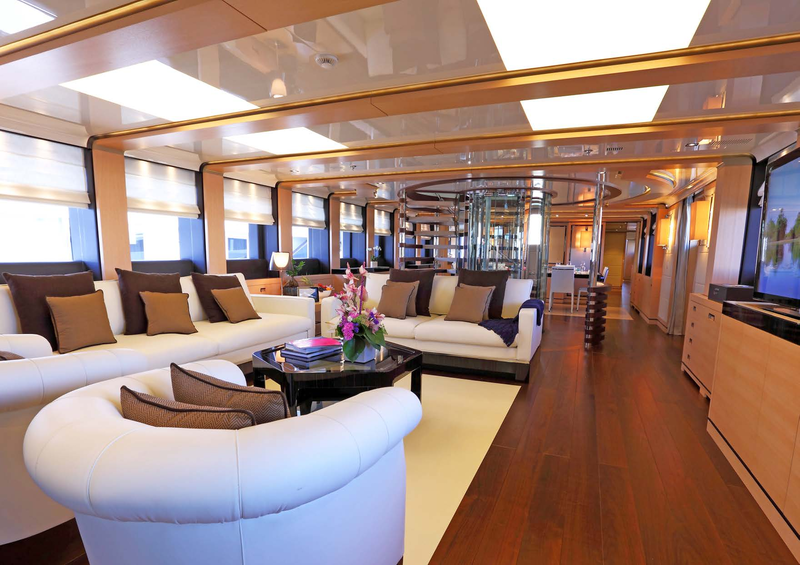 Behind the central staircase is the lounge, within which there is a pair of sofas and overstuffed armchairs placed around a grand coffee table. 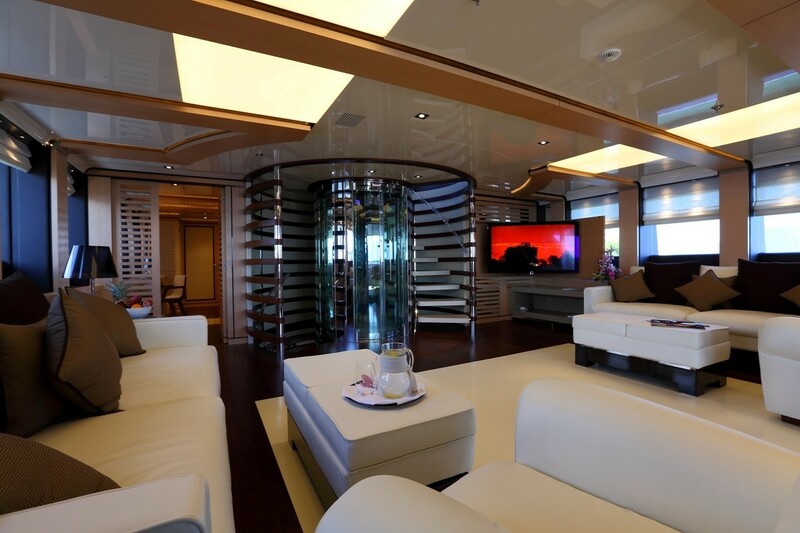 Opposite the seating area is a widescreen TV which is concealed within the cabinetry when not in use. 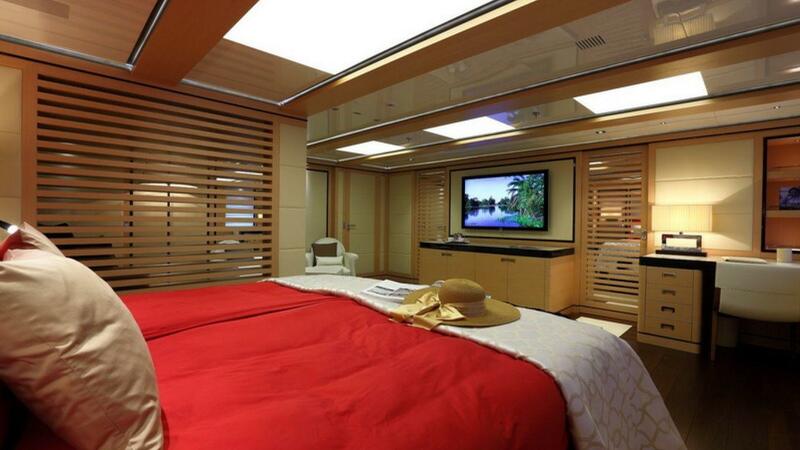 The bridge is set on the upper deck forward with the second Master suite placed amidships. 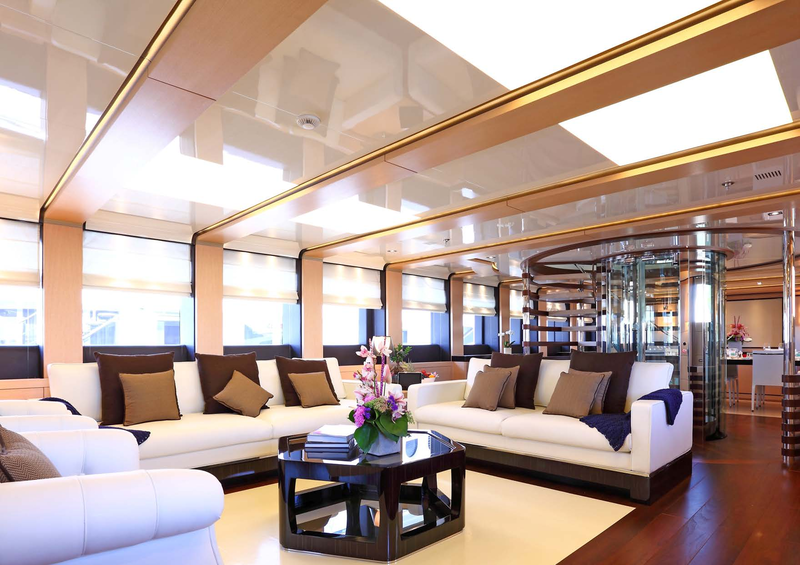 The aft interior is dedicated to the sky lounge, where the mirrored layout provides two sofas, armchairs and coffee tables to create separate social areas. 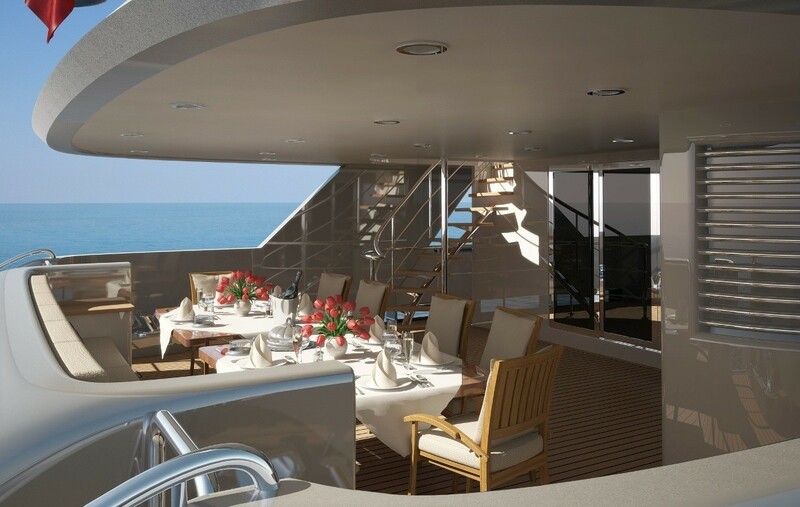 A pair of Caterpillar C32 Acert engines allows for a maximum speed of 15 knots and a cruising speed of 12 knots with a range of over 4,500 nautical miles at economical speed. 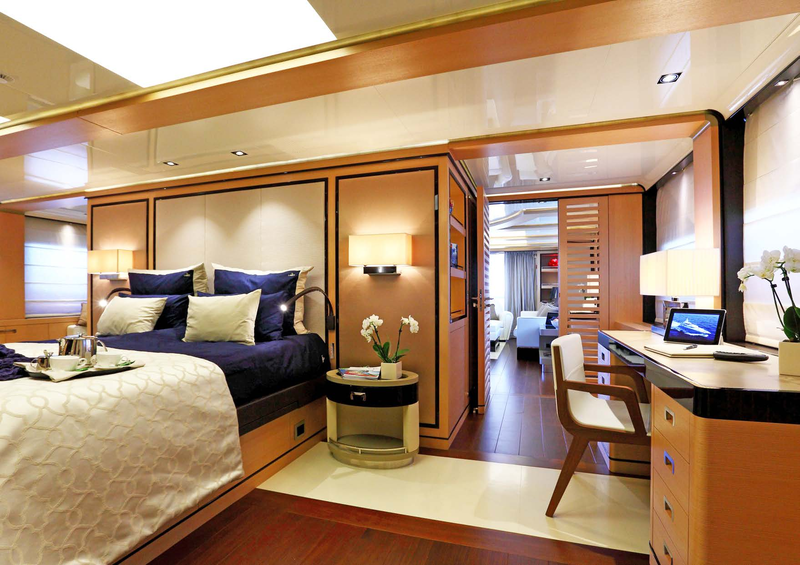 The accommodation layout is designed for a maximum of 12 guests across 6 en-suite cabins: 2 Master suites, 2 VIP staterooms and 2 twin cabins, one of which is convertible to a double. 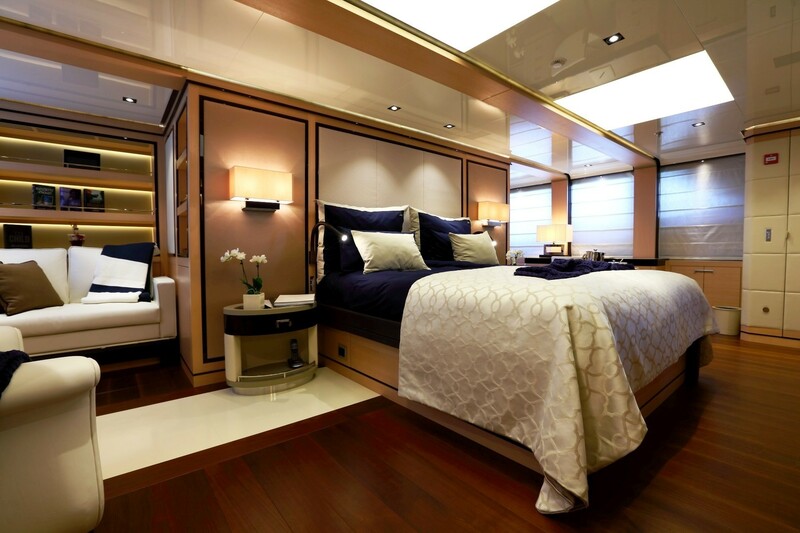 ~ The upper deck Master suite is located amidships and features a king-size bed, a comfortable seating area and a study as well as a large walk-on wardrobe. 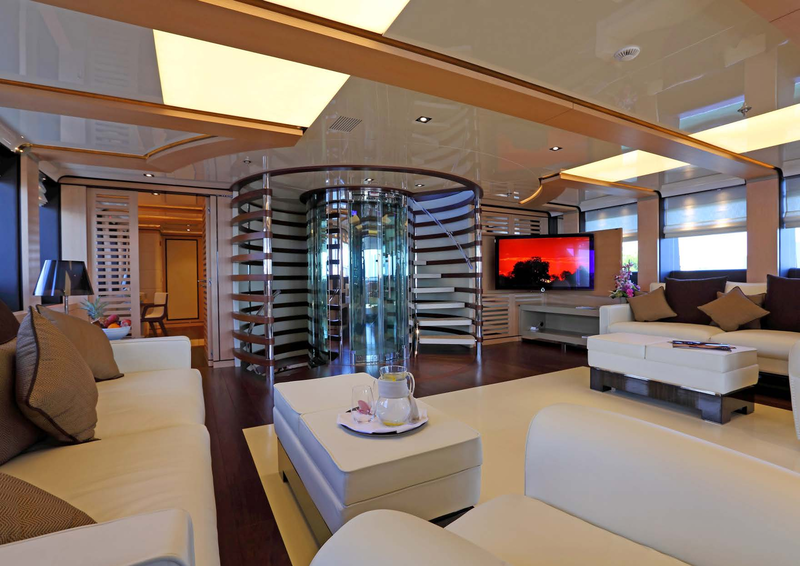 A 60” flat screen TV, a stereo with an iPod docking station and speakers are also available for entertaining. 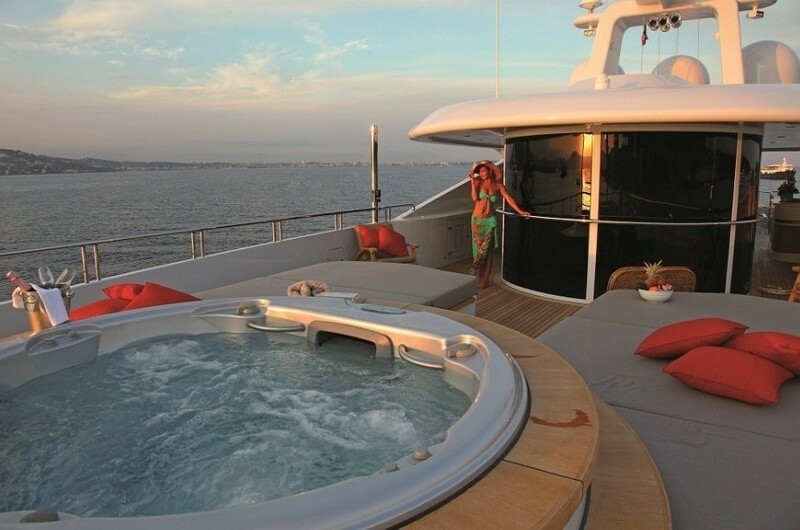 In the bathroom there is a jet shower, a Jacuzzi tub and sink finished in marble, a toilet, bidet and a towel warmer. 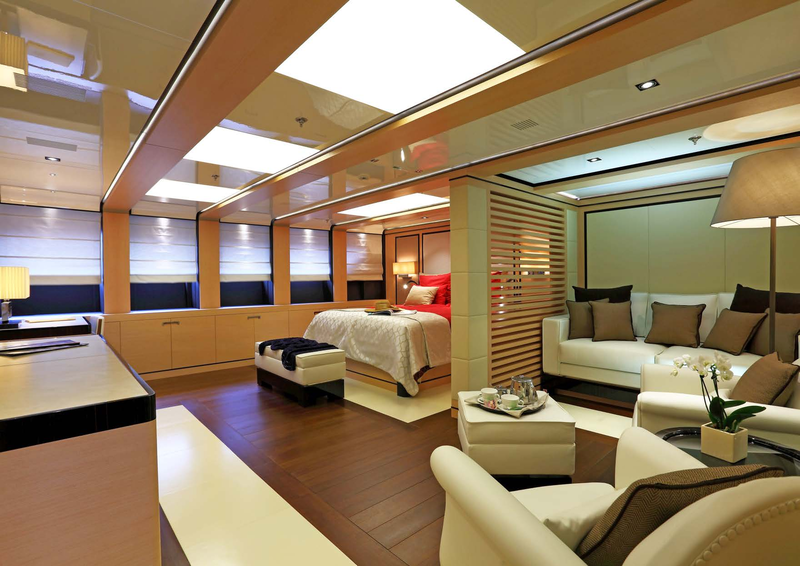 ~ On the main deck the Master suite is situated forward and contains a king-size bed, sizeable lounge, a desk, a 60" flat screen TV and a walk-in wardrobe. The en-suite bathroom has a Jacuzzi tub, jet shower, and sink all finished in marble as well as a towel warmer, toilet and bidet. 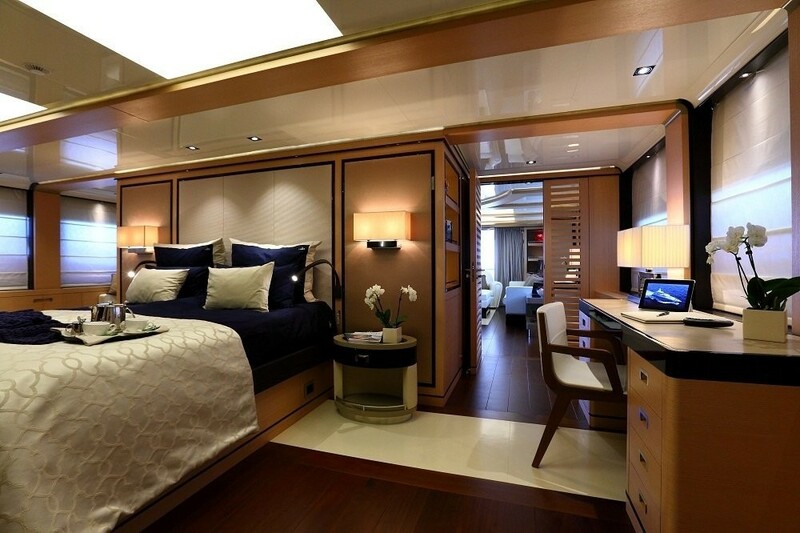 ~ The lower deck places the two twin cabins forward and the VIP staterooms aft. 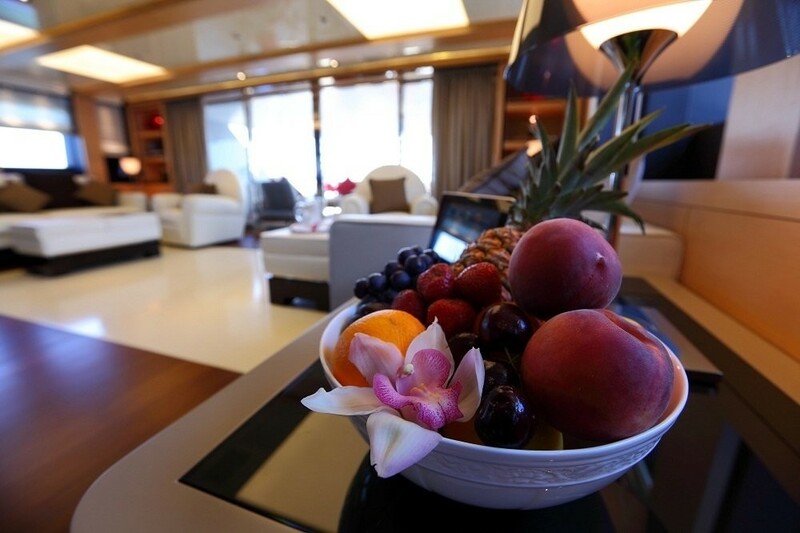 The port and starboard VIP staterooms are both furnished with a double bed, work desk, a 32" flatscreen TV and two wardrobes. A shower, sink, toilet and bidet are available in the en-suite facilities. 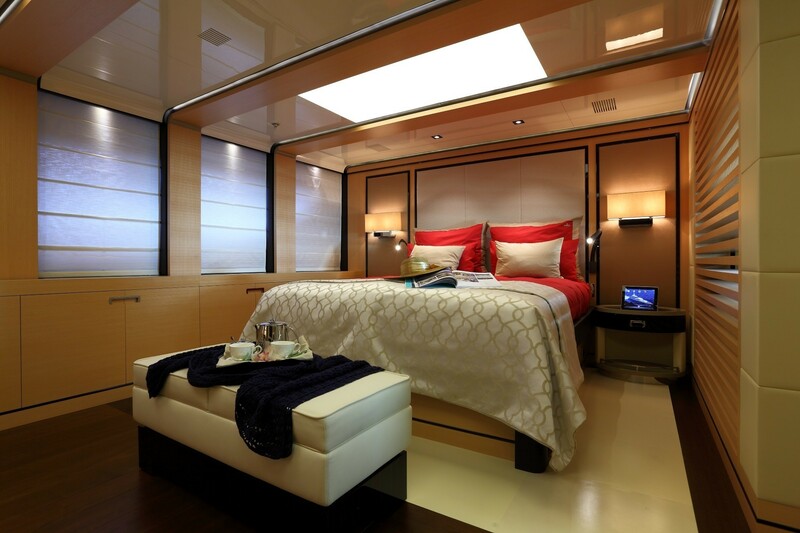 ~ The starboard twin cabin differs from the port twin cabin in that it can be converted into a double. 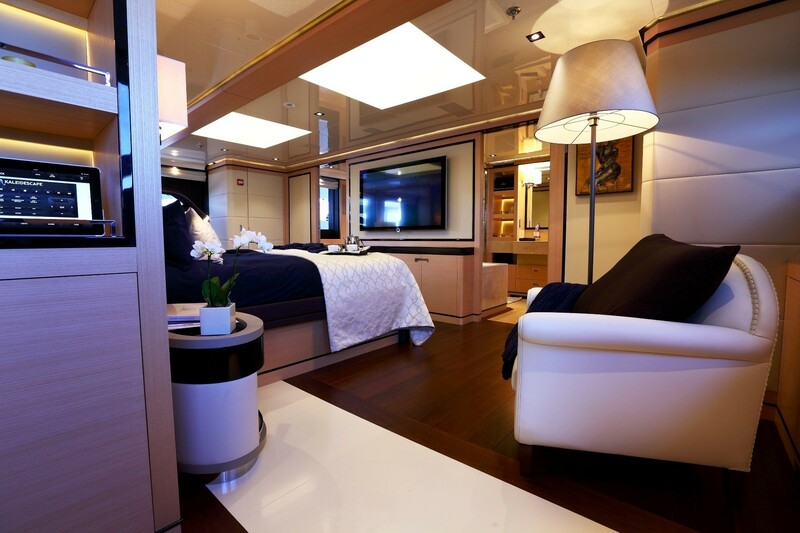 Both twin cabins contain a pair of single beds separated by a bedside table, a 32" flatscreen TV and a wardrobe. 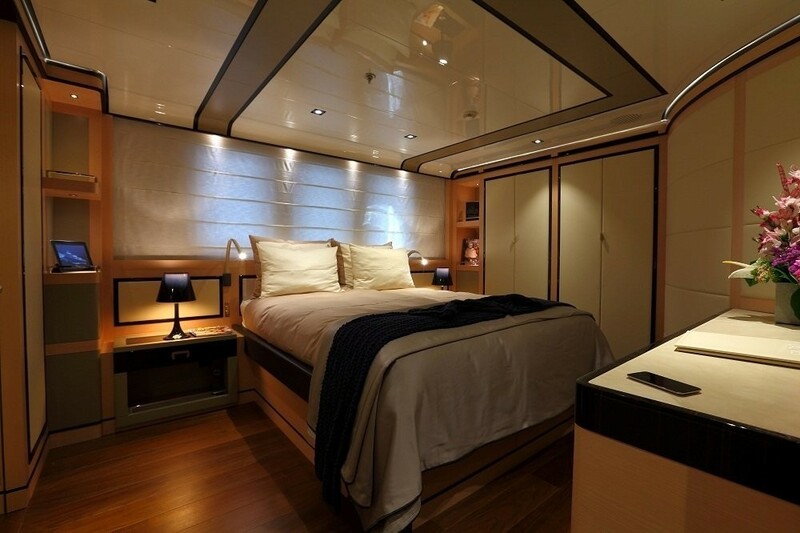 The en-suite facilities provide a shower, sinks, toilet and bidet. 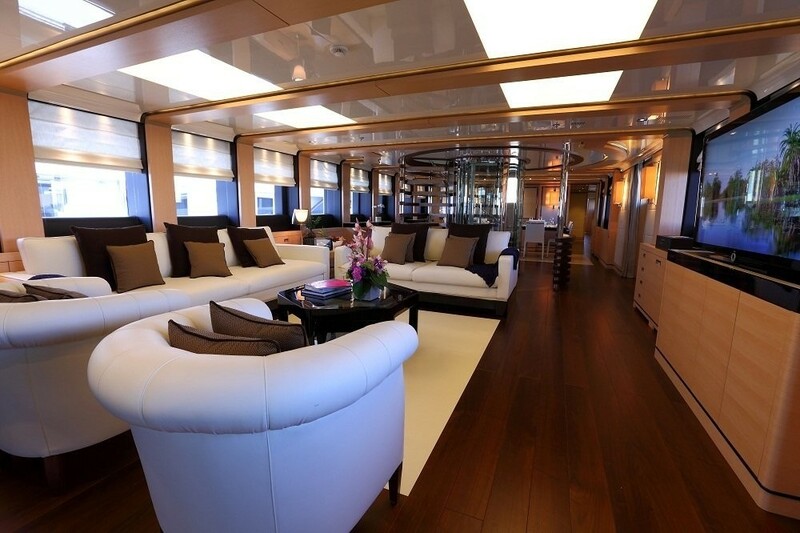 ~ The crew of 10 is accommodated in the lower deck bow section with the Captain's cabin located on the upper deck. 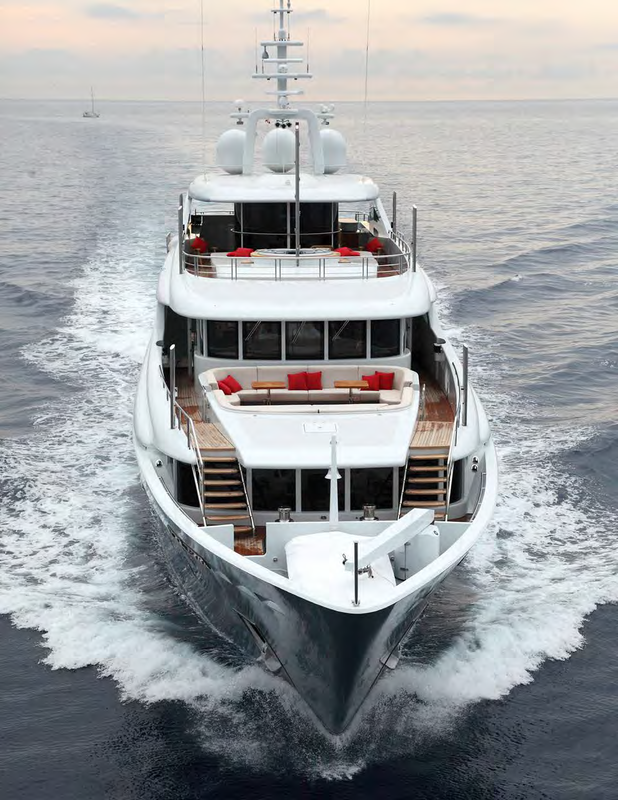 We do have available further amenity, owner and price information for the 46.35m (152' 1") yacht 46M CUSTOM SUPERYACHT, so please enquire for more information.